PIERRE, S.D. -- The Museum of the South Dakota State Historical Society, located at the Cultural Heritage Center in Pierre, announced its new status as a Smithsonian Affiliate on Thursday evening, Jan. 10, at a reception where Gov. 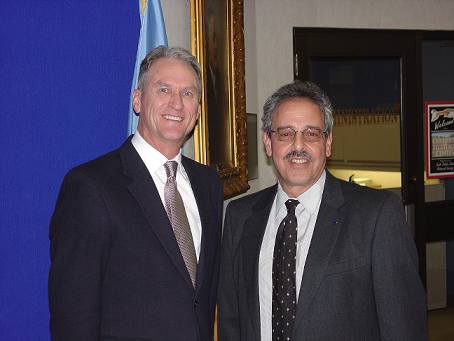 Dennis Daugaard proclaimed Saturday, Jan. 12, as “Smithsonian Affiliation Day” in the State of South Dakota. In recognition of that, the museum held a public reception with free admission on Saturday. To help celebrate the new partnership between the State Historical Society Museum and the Smithsonian, the public enjoyed some hands-on activities during the reception on Saturday. They created small, folded sticker books to hold stickers relating to the many fine museums that are part of the Smithsonian – art, history, American Indian, air and space, culture, and the zoo. Another hands-on activity was making a paper plate glider and seeing how well they fly. Airplane coloring sheets were also available. Visitors to the Cultural Heritage Center also enjoyed various staff presentations about the new Affiliate relationship as well as videos from the Smithsonian Institution in the Observation Gallery. Among the videos shown were the very popular “Stories From the Vault” series that takes people on a tour of the collections at the Smithsonian Institution. The Cultural Heritage Center is located at 900 Governors Drive in Pierre.